There is a curious sentence in Walter Benjamin’s “Mickey Mouse,” a fragment unpublished during his life, in which he writes: “In these films, mankind makes preparations to survive civilization” (545). He goes on to say that “Mickey Mouse proves that a creature can still survive even when it has thrown off all resemblance to a human being. He disrupts the entire hierarchy of creatures that is supposed to culminate in mankind” and ends with the idea that these cartoons are well-loved because “the public recognizes their own life in them” (545). Benjamin’s version of this story barely touches on the lost lives and instead emphasizes the history of the bridge’s engineering and materials. In his words: “Nevertheless, it can be said that the most conspicuous changes to the globe over the course of the last century were all more or less related to the railroad. Today I’ll be telling you about a railroad catastrophe, but not only because it’s a horrible and frightening story. I also want to place it within the history of technology, specifically of railroad construction. The story is of a bridge. This bridge collapsed” (171). The history of technology he tells, then, is how this railway bridge was being developed over an area with frequent, wild storms. While it was being built in 1877, a gale comes through and wipes the bridge out while still in construction. The engineers and builders start over, and a year later the bridge is complete. A year after that, the bridge disaster takes place. He describes that some say the wind blew the train off the track, causing it to rupture the bridge track on its way down, and sending the train and passengers into the water. Benjamin suggests, however, that the weather may have caused the rupture to the track, sending the train hurtling into the void. In the second instance, the bridge integrity is under scrutiny to a greater degree, and therefore, engineering technology itself is under critique. Benjamin rhetorically positions himself as one of those progressionists who think we were stupid in the past but we are wise now: “Today we know what technology is … But when at the turn of the last century men were creating the inventions that transformed the face of the entire world—the mechanical loom, gas lighting, the iron foundry, the steam engine—no one really knew what these great technicians and engineers were making. Indeed, even they didn’t know the import of their work” (171). He offers a foil to the bridge: “the tower completed by Eifel for the Paris World’s Fair, just ten years after the collapse of the Tay Bridge. The Eiffel Tower, when it was built, had no function whatsoever; it was just a landmark, a wonder of the world, as they say. But then came the invention of radiotelegraphy. All of a sudden the soaring structure had found a purpose” (175). This lesson on progress stipulates that when materials progress does not have to match design progress. This bridge used iron, but the design was meant for a material like wood. The Eiffel Tower, on the other hand, was made merely to show off what iron could do for the global audience, and thus its design pushed iron to new design limits. The bridge is practical, but exhibits disharmony between design and material, while the Eiffel tower is useless, but displays harmony between design and metal. But dangerously, in both cases technological progress surpasses our ability to know; it surpasses our ability to see both its disastrous implications and its pragmatic functions. Mickey Mouse cartoons become a prime example of the logic Benjamin has provided in his unusual reading of metal technology. In “Experience and Poverty” Benjamin writes, “The existence of Mickey Mouse is such a dream for contemporary man. His life is full of miracles—miracles that not only surpass the wonders of technology but make fun of them” (734-735), a task Benjamin took seriously. But further, Mickey performs the cyborg miracle we cannot achieve: “For the most extraordinary thing about them is that they all appear, quite without any machinery, to have been improvised out of the body of Mickey Mouse, out of his supporters and persecutors, and out of the most ordinary pieces of furniture, as well as from trees, clouds, and the sea” (735). Mickey’s miracle technology is the utterly practical, problem-solving of making life easier while still having the harmony between supposed opposites: “Nature and technology, primitiveness and comfort, have complete merged. And to people who have grown weary of the endless complications of everyday living and to whom the purpose of existence seems to have been reduced to the most distance vanishing point on an endless horizon, it must come as was tremendous relief to find a way of life in which everything is solved in the simplest and most comfortable way, in which a car is no heavier than a straw hat and the fruit on the tree becomes round as quickly as a hot-air balloon. And now we need to step back and keep our distance” (Experience and Poverty 735). Iron is a good example of material progress, but it could be anything. Benjamin tells in another radio show that a train manufacturer “counts finished locomotives the same way some people count years” (“Borsig” 55), which is to say, progress toward the future can is often counted through commodity. The train is an easy metaphor because not only is it literally an object of significance in the understanding of civilization, but it is a conceptual metaphor for more-than-trains too: “In the nineteenth century, the image of the train came to predominate—the metaphor of the locomotive advancing, at increasing speed, towards the radiant future, towards the station ‘Utopia’, sweeping away all the obstacles in its path” (Lowry 113). Take a look at this Mickey Mouse cartoon from around 1930 that Benjamin may have seen, as it doesn’t appear to have been censored in the Weimar Republic. 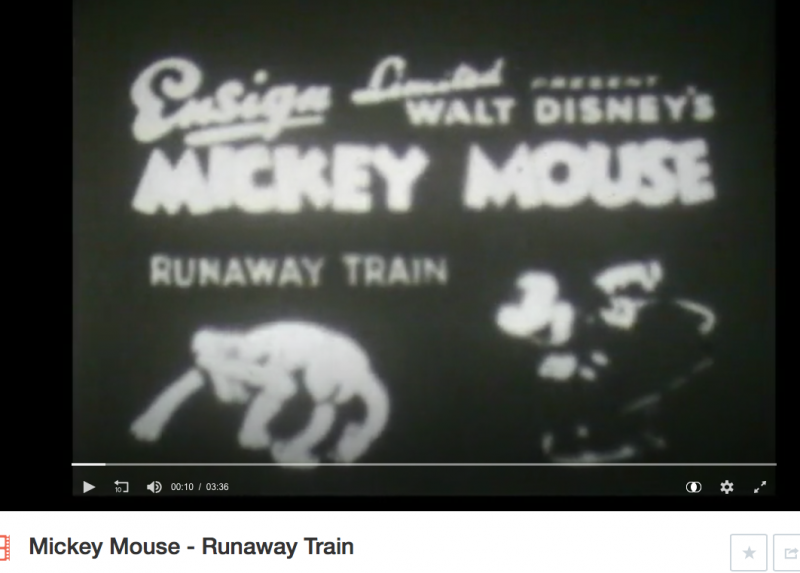 Mickey and Minnie are dancing and kissing on a locomotive when they face some bad engineering: the track sags as they cross the bridge, nearly having a Firth of Tay disaster. It can barely get up the big hill, so Mickey has to get out and push it, which causes Minnie’s car to come loose. He chases her and the train chases a distressed milk cow and hits a tree. The train car pieces dissemble in the crash and fall back into place as a little pump car. The steam engine could not get them where they were going, but the anachronistic pump car, powered by the passengers themselves, takes them happily back down the track. The old technology requires much more work, but has the ability to navigate the track without becoming a runaway train. Benjamin, Walter. “Borsig.” Radio Benjamin, edited by Lecia Rosenthal, Verso, 2014, pp. 50-55. Benjamin, Walter. “Experience and Poverty.” Walter Benjamin, Selected Writings, Vol. 2 Part 2 1931-1934, edited by Michael W. Jennings, Howard Eiland, and Gary Smith, Harvard UP, 1999, pp. 731-736. Benjamin, Walter. “Mickey Mouse.” Walter Benjamin, Selected Writings, Vol. 2, Part 2 1931-1934, edited by Michael W. Jennings, Howard Eiland, and Gary Smith, Harvard UP, 1999, 545-546. Benjamin, Walter. “The Railway Disaster at the Firth of Tay.” Radio Benjamin, edited by Lecia Rosenthal, Verso, 2014, pp. 170-175. Lowy, Michael. Fire Alarm: Reading Walter Benjamin’s “On the Concept of History.” Verso, 2005.